Being curious, personable, and quite intelligent, the Maximilian's Pionus or Scaly-headed Parrot is truly a fun and well-rounded family pet!. The Maximilian's Parrot appears rather plain from a distance but like the Dusky Parrot, has a variety of subtle colors that are particularly beautiful when seen in full sunlight. It is also known as the Scaly-headed Parrot because of its head feathers having grey edges giving it a scaly appearance. The Maximilian's Pionus, Maximilian's Parrot, or Scaly-headed Parrot is one of the more popular and commonly kept Pionus parrots. They are becoming increasingly more popular and are favored not only for their sweet disposition, but along with the Blue Headed Pionus are noted for their talking ability and can readily be taught to speak. These little parrots are very inquisitive, intelligent and have very good memories. Once they have learned a behavior such as stepping up they are very obedient and will remain steady in their training. The Maximilian's Pionus has one of the nicest pet bird personalities. It is a perfect pet for first-time parrot owners and makes a wonderful family pet since they may be handed by several people and maintain their sweet disposition. It is also a great pet for people who live in apartments or in close proximity to neighbors (where noise can be a problem) because they have a relatively quiet calm personality and are easy to maintain. Distribution: These birds are found over much of eastern South America from north Brazil to Bolivia, Paraguay, and Argentina. They inhabit lowland forests and open woodlands. Description: The Maximilian's Pionus, though not the largest of the Pionus species, is a small to medium size stocky parrot with a wonderful personality. They are pale green with a more bronze color on the underparts. The back and wing feathers can range from dark to light olive-brown and many of the feathers are edged in various shades of blues and greys. The head feathers have grey edges giving them a scaly appearance, the forehead is almost black, and the cheeks are green edged in a dull blue. The chin and across the lower throat are a dusky blue or violet which will vary in intensity from bird to bird. The central tail feathers are green with the outer feathers being blue and they have the bright red undertail feathers distinguishable to all the pionus. The beak is a yellowish horn color getting darker close to the head, the eye is dark brown circled by an eye ring varying from white to gray, and they have gray legs. Juveniles have paler coloring and less blues on their throats than the adults. Dr. Jungle is pleased to introduce his associate...at Animal-World! "Daidie" came to Animal-World at about 6 weeks old and I'm sure glad she did!" "She has a calm, sweet, quiet disposition and has greatly influenced the type of bird that I, Dr. Jungle, am today." My associate Daidie is never one to be left out of the action. She is always asking me, "Whatcha doin?" "As you can see, Daidie has no problem thinking outside the box! ...open to experiencing the world as a "big bird" she explores this macaw playpen." Size - Weight: These birds are a medium sized Pionus and grow to a length of 11 /2" - 11 3/4" (29 - 30 cm). Social Behaviors: In the wild they are generally seen in pairs or in small flocks of up to about 50 birds. These birds tame very easily and are very sociable. They are not loud like many conures and amazons. They have very steady personalities and do not tend to bite. Breeding/Reproduction: There is no visible means of sexing these birds. Place a nest box high up in a dark area of the aviary. The female will lay 3 to 5 eggs which incubate for about 26 days. Pairs may take mealworms and greenstuffs when they have chicks in the nest. Corncob is a favorite weaning food. The young will wean in about 2 1/2 - 3 months. 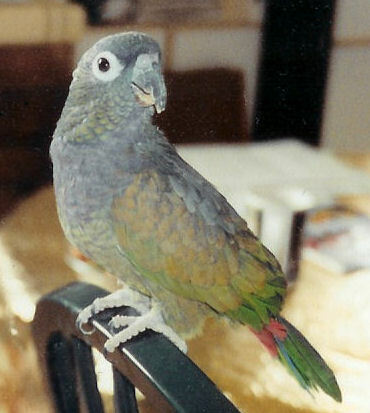 Potential Problems: The Maximilian's Pionus is a relatively healthy bird, though the Pionus parrots have been known to be more susceptible to the infection aspergillosis than other species. The main symptom is heavy, belabored breathing. Availability: This bird is frequently available. They are becoming increasingly popular and are widely kept. The other two most frequently available pionus are the Blue-headed Pionus and White-crowned Pionus. I got my maximillians pionus ( Webster ) when he was 1 yr. old....My husband had just passed away. I lived with my Daughter and family. None of them paid any attention to him, He is 19 yrs. and I've had him 18 yrs. His first owner was a man and he hand fed him, then at 6 months old a lady brought him to the pet store where I worked part time. I fell in love with him the first time I heard him say Hi! Sweetheart... that did it for me. My husband always called me Sweetheart until he passed away. Problem: He doesn't like anyone but me and he doesn't want anyone near me especially a guy. I tried socializing him but with none of the family trying to be friends with him he doesn't like anybody. Is it too late to help him like other people? I have a schnauzer and a cat. They all get along fine together.